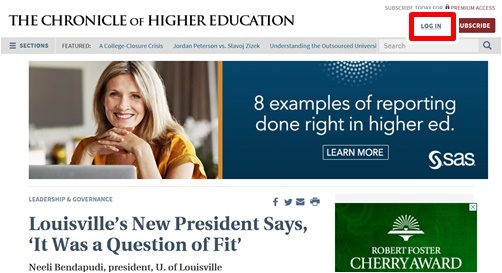 The Chronicle of Higher Education is the top source for news in post-secondary education. It brings you news stories of concerning faculty, administration and technology as well as academic news from around the global. You also have access to many blogs devoted to different aspects of the university experience (admissions, scholarly publishing or building and grounds) and also to the forums where you can connect with people involved in higher education around the country and around the world. The UI&U Library provides access to the Chronicle without the additional step of logging on through the library. Simply go to chronicle.com. In the upper right hand corner, click log in. (Don’t subscribe! We’ve done that for you!). Then create a free account using your Union email. Please contact a librarian if you have questions or need assistance.